Posted in Necklace, Outfit, Shoes, Uncategorized. I am feeling a bit feisty today, and I am not quite sure why, other than the weather has once again turned towards Spring and I am looking quite forward to it’s rather late arrival. The garden has been planted for a bit now with the more resilient plants and next week all the baby plants in the kitchen window get to find their way into the soil, but not before the fence is finished so the rabbits can stop running off with my baby Rhubarb and Swiss Chard! And of course as the temperatures rise we have a tendency to shed layers and start revealing more skin, and if you are looking for an ensemble that goes from the runway to the beach then look no further than this amazing ensemble from Virtual Diva, currently at Swank! Coming to Whimsical on the 18th – not a gacha! 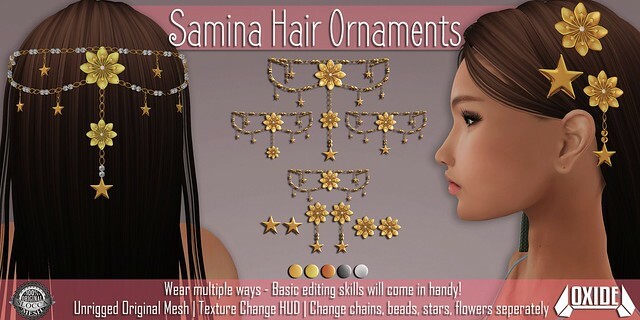 ♥ Mod and will fit most hair with some basic editing skills. Accessories for hair, wear different ways (different variations shown above all pre-linked in one pack). For more adventurous needs, basic editing skills will be handy. Texture change – you can separately change the textures for the chains, beads, flowers and stars. Unrigged, Copy/Mod – Duplicate as needed, cover your hair in flowers and stars, break it apart as you see fit…change attachment points and place is anywhere you like. Go nuts with it! Posted in Accessory, set, Women.